Don’t Move. Just feel like you did. Moving is stressful, expensive, and a seemingly endless project. Don’t move. Just feel like you did with a Space Like New. When you partner with Distinctive Offices, your office refresh won’t disrupt your work. No delays. No disruption. No mess. No slipped schedules. And no runaway costs. Our proprietary process gives your space a fresh, contemporary look without interfering with work. At all. Our Rapid Facelift Process gets renovations done in days. Not weeks. Days. When your lease is expiring, don’t move. Renew and refresh with Distinctive Offices. In the end, office renovation is about making an old space new. Which means it’s about, above all, design. Well-designed space is an important enhancement for your team, and communicates a lot to clients and visitors, too. Our design professionals are experts in helping you develop the look you want, at a price and on a schedule you can manage. Unlike new space, renovating an occupied space means determining whether, and how, to work with what’s already in place. Our team will help you decide what to keep, what to refinish or replace, and show you how all the pieces fit together. We’ll create a presentation showing you exactly what your new space will look like, how we’ll create it, and what the cost will be. In our Manhattan showroom, you can browse through all kinds of options for flooring, walls, surfaces and signage, and come up with a signature look that’s all your own. Often, we show clients options they didn’t even know were possible. Review, approve, and we’ll take care of the rest it. Along with floor coverings, walls define and tie together a renovation. We have expertise in, and knowledge of, an incredibly broad range of possibilities. We’ll work with you to select colors, finishes, materials and wall systems that will complement the rest of your décor, and provide the durability and look you need. Whether it’s wallpaper, paint, acoustic systems or something else, we’ve got it, and we’ll help you choose it. We’ll also help you think through what you need. Depending on the configuration of your space, your budget, and your usage patterns, you may need something that provides a high level of durability. Or is especially easy to clean. Or absorbs sound, or protects surfaces. The right wall covering is unique to your space, your needs and your priorities. We’ll help you define it, and then help you make it real. And in renovations, it’s particularly important to keep in mind environmental factors. Has the material been certified? By whom? Are you in a LEED-designated building? And what about end-of-life – when it’s time to remove or replace wall coverings, what are the implications? Our team will help you assess all these factors, then make the choice that’s right for your company. Along with wall coverings, flooring is a critical element of your redesign. In addition to appearance, a host of other factors come into play – durability, sound absorbency, ease of replacement or repair, and sustainability, just to name a few. There are an astonishing number of options. We’ll help you make sense of it all. 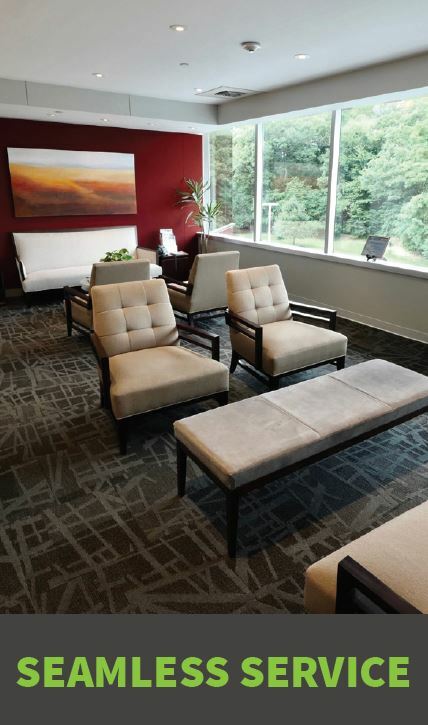 Working with your staff, we’ll help you think through how the space will be used, the overall look and feel you’re going for and other issues, and determine what floor covering works for you. The Distinctive Offices team has working relationships with all the major carpet manufacturers. Along with carpet tile and broadloom, we have a wide selection of all of the latest luxury vinyl tile products along with luxury composition tile, sheet vinyl and hardwood. Whatever your office needs, our team can source it, allowing you to select floor covering that both looks great, and stands the test of time. Literally. An essential element of renovation is redoing working surfaces. 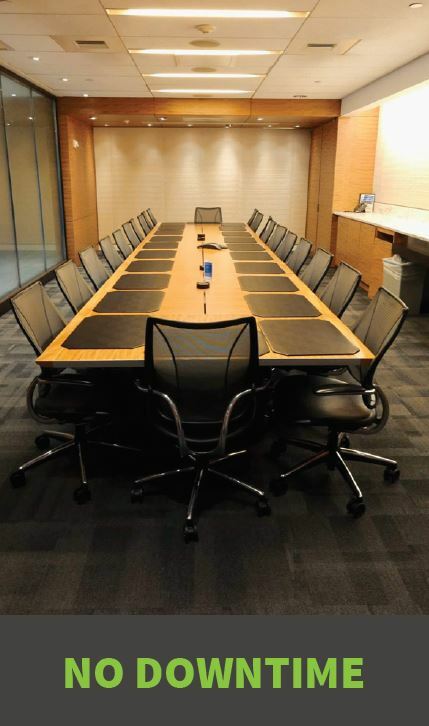 These include cabinets in break rooms and elsewhere, elevator doors, worktables in office common areas, restrooms and a host of other surfaces. Clients are often surprised to realize how much of the office’s look and feel is influenced by these surfaces, and excited to realize what they can do with them. They’re also pleasantly surprised to discover the range of durable, high-quality decorative film available for these surfaces. There is an almost limitless array of alternatives available – with the help of an experienced, expert member of our design team, we can select a finish that beautifully complements your design. And costs a fraction of what demolition and replacement would. Patterns include a wide range of wood grains, along with metallic, linen, lattice and other effects. Bright accents? Neutral tones? Metallic? Stone? The options are limited only by your imagination. The final, critical accent in a renovation is the lettering and design of your interior signage, beginning with what visitors see when they first step off the elevator. Signage is specifically intended to be eye-catching, and by blending innovation with functionality, can finalize and beautifully accent your design. Signage is typically the first thing visitors to your office see when they arrive, and the last thing they see when they depart. Expertly designed signage has a powerful impact, and directly reinforces your firm’s brand. This happens not just through use of your firm’s logo and typeface, but by the selection of materials, lighting, placement, size and other aspects. Great signage is an art form. We’ve developed beautiful, effective signage systems for clients ranging from global law firms to specialized boutiques, in every kind of space imaginable. We’ll work with your team to do the same for you. Signage is a powerful, direct statement of what your firm stands for and what your clients can expect, and can be a surprisingly creative part of your design. We’ll insure that your firm’s message is unmistakably and elegantly communicated to everyone who sees it.